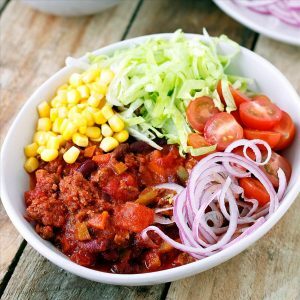 An easy to prepare, delicious Mexican mince packed with plenty of vegetables. Heat oil in a large frypan on a medium heat. Fry onion and garlic for five minutes until softened. Add mince and stir until meat cooks through. Add cumin, smoked paprika, carrot, capsicum and kidney beans. Add the crushed tomatoes, tomato paste and stock. Simmer gently for 20 minutes, until the liquid is reduced. Serve with salad vegetables, basmati rice or tortillas if desired.